If you ask anyone to list a few important or eye-catching buildings downtown, I’m sure you would hear the Murat Theater and the Riley Towers often. While this isn’t intended to be another lecture about how the parking lot explosion of the mid 20th century did this or that, please consider a time when such grand buildings could have co-existed alongside quaint apartments. 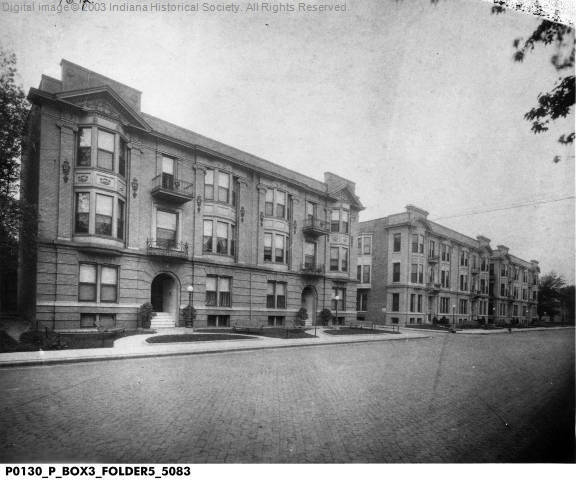 These three apartment buildings on the south side of East North Street are mirror images of each other, built in the Beaux-Arts style at the turn of the 20th century. The original Arlington Flats built in 1902 (323-339 E. North) were the same size and layout as the Marina Flats (311-317 E. North) and the Clarina Flats (301-307 E. North), both built in 1905. After additions to the original structure in 1912, it was sometimes referred to as the Arlington Annex; the addition was completed under Julius Matzke for $4,000 in March of 1912. Julius Matzke and his wife May were the owners of all three flats. Julius was born February 14, 1850 in Breslau, Schlesien, Germany (now in Poland) and died June 4, 1926 in Indianapolis. 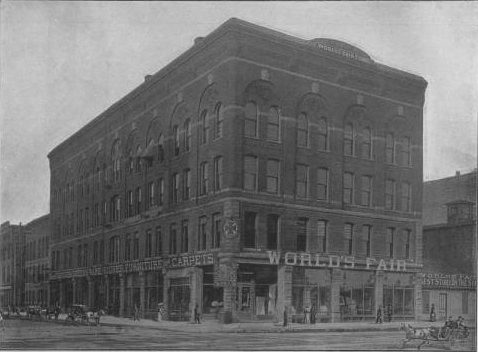 Besides owning properties, the construction of new buildings was one of Matzke’s main interests. 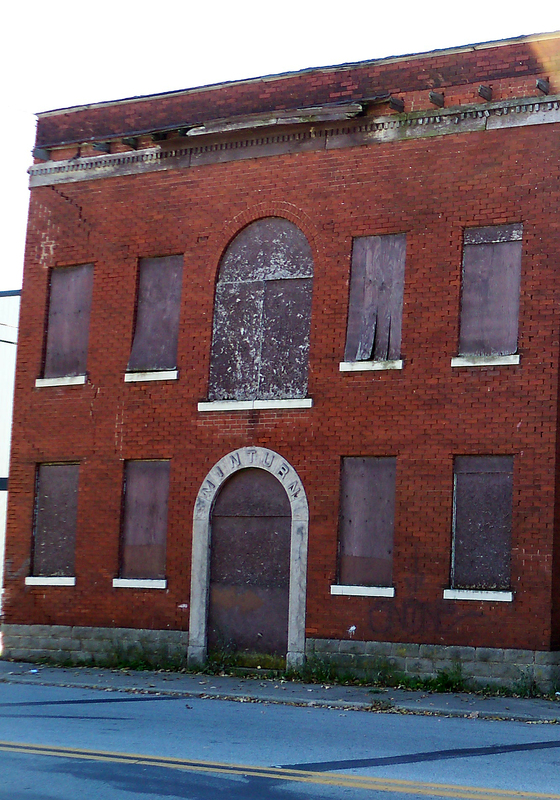 In 1915, he oversaw completion of a $20,000 structure at 522 North New Jersey Street which was built by Chas Freijs. 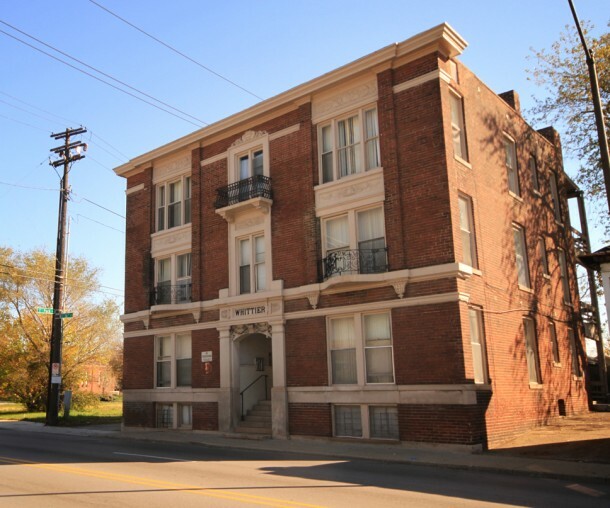 He also had an apartment building in his name at 509 North Illinois Street. Julius Matzke named the Clarina and Marina Flats after relatives, presumably his daughters, Clara and Marian Matzke. The Clarina and Marina Flats took up the entire half block from Alabama Street to the Ogden Street alley. On the other side of the Ogden alley to New Jersey Street stood the Arlington, once the addition was completed. There were two entrances to each 3-story building. According to the Sanborn maps, each floor had 12 foot high ceilings. The facades are all the same, except that the bay windows were made out of wood on the Clarina and Marina Flats, but they were made out of brick on the Arlington Flats. One interesting fact for you libation lovers: in 1921, stills of bootlegged liquor were discovered in the basement of Arlington Flats. Near the Marina and Clarina was a very small apartment structure, the Gaylard Flats. The rest of the block on the Alabama Street side was mostly homes–some wood frame and others of brick– some of which had been converted into duplexes. These flats were as little as $30/month to rent! There was one small auto repair shop for a time on Ogden. 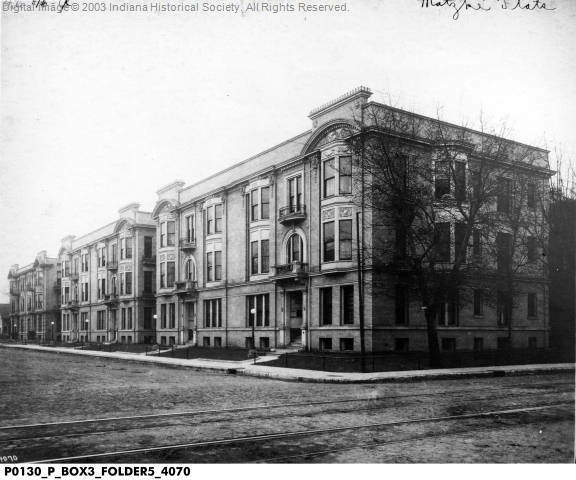 Between the Arlington Flats and the Murat Temple (before the Murat addition to the north), was a small apartment building called the Trenton Flats, a few homes, and a steam sanatorium. 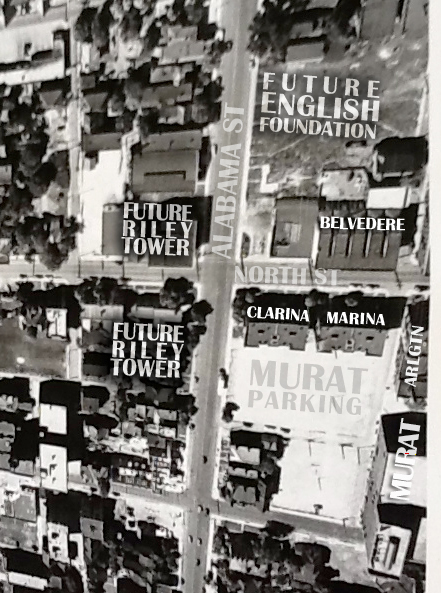 This whole area is now parking lots for the Murat Theater, built in 1909. The Arlington Flats were demolished in 1952, likely to add parking for the Murat. The Marina and Clarina Flats were demolished in 1962–perhaps to make room for the construction at Riley Towers, which began that summer. Map of the area, all mentioned structures labeled, ca. late 1940’s. This 3-story brick building built in 1901 was 109 feet long and was 130 feet deep. Located at 306-314 East North Street, it contained 20 units and also had 12 foot ceilings. The units had hardwood floors and were either 4 room units or 5 room units. The overall shape of the structure would be considered an E-plan. Instead of the flats being built with walls separating them, there was actual outside space separating each flat throughout most of the space (no noisy neighbors, how nice!) The Belvedere changed hands multiple times in the early 1900’s. Lawsuits were filed against owners and it was traded for other properties, including farms. Most notably one trade for a 552-acre farm to Frank Fletcher. On the other side of the alley were two smaller apartment buildings, the Arthur and the Elberon. The block was mostly homes, and a few duplexes. Today the area provides parking lots for the English Foundation Building, built in 1953. It would be fair to conclude that these flats were also demolished in 1962 to make room for the Riley Tower construction. Beaux-Arts was a leading style at the beginning of the 20th century after the Chicago’s World Fair in 1893 shocked and awed with the trend. 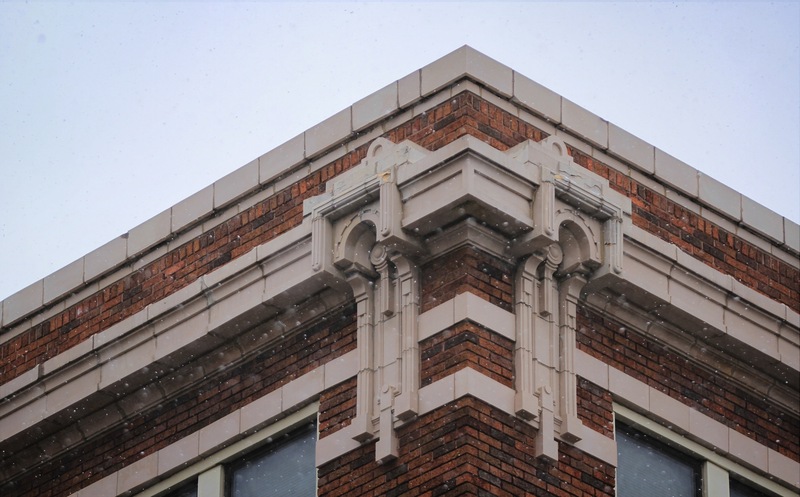 Some important stylistic elements include: pedimented entablature, pronounced cornices, balustrades, rusticated finishes, parapets with medallions, and columns. In most monumental buildings, these elements are very pronounced with a great deal of decoration. 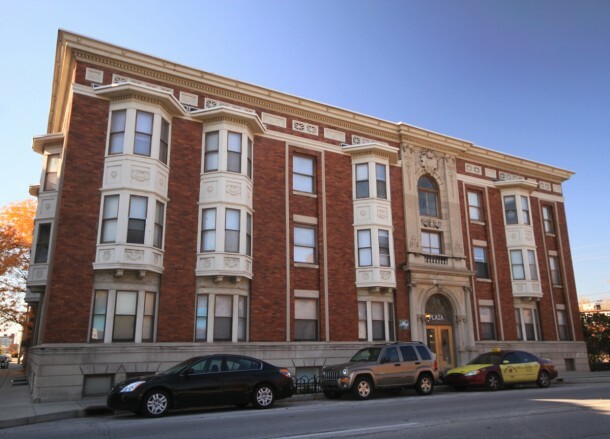 In the photo of the Arlington, Marina, and Clarina Flats, one can see examples of this in the rusticated raised basement and ground story, columns (however much more simple since this is only an apartment, not a monumental building), deep pedimented windows, and a reference to balustrades. The Plaza, 902 N Pennsylvania St. Note the rustication on the ground floor, bays on the 2nd and 3rd floors, and embellished parapets. The Whittier, on 16th Street between Central Avenue & New Jersey Street. A much simpler version of the Plaza but still noteworthy. Balconies similar to the Arlington, Marina, and Clarina. 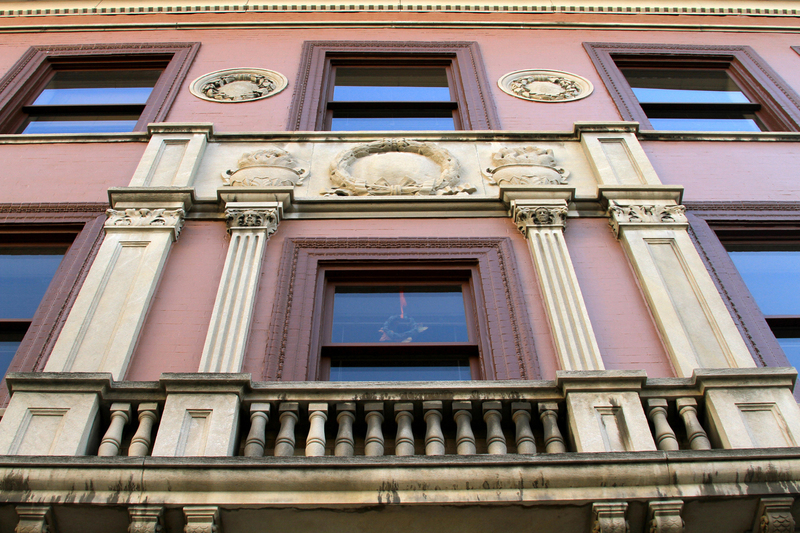 Simple parapets, embellished ornamentation above windows. Matzki (Matzke) Flats at 509 N Illinois St, built by Julius Matzke. Beaux-Arts with touches of heavy arches. Almost the same layout and design as the Arlington, Marina, and Clarina Flats. These beautiful 3-story apartment buildings used to be on every corner in the city, where have you found some to admire? Jordan Ryan is a 2017 graduate of the IUPUI Public History master's program. Her research interests include Indianapolis demolition patterns, urban and city planning history, and LGBT history. She is currently a collections and digitization assistant at the Indiana Historical Society, with a focus on architectural archives. In her free time, she enjoys restoring an 1867-workers cottage in the historic Fountain Square neighborhood. Hi I’m great-great grandson of Julius Matzke, my family still reside in Indianapolis area and I’ve been doing research into genealogy and came across your article. It is mostly accurate to the facts from the family bible and stories that were passed down to me and photos. If you’d like to talk more about this I’m open.